We accept either direct credit card payment or orders through PayPal. 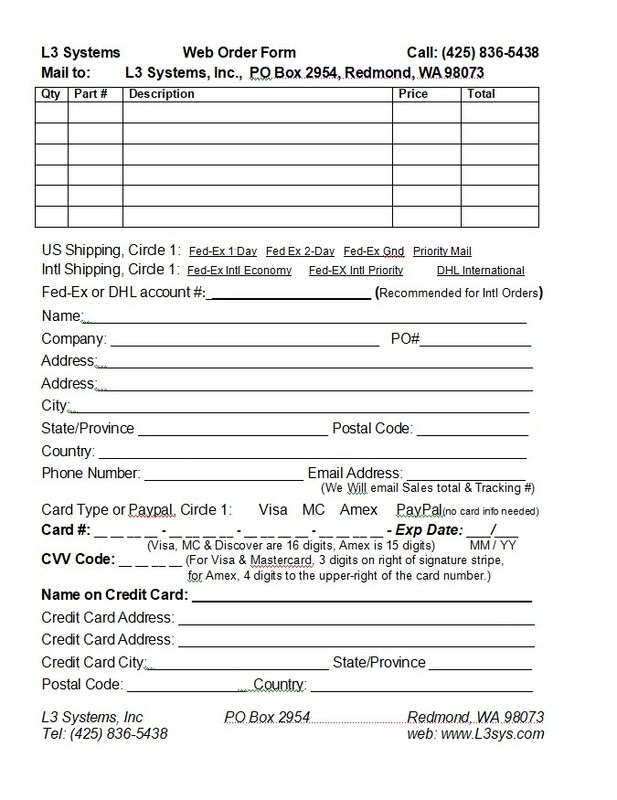 We suggest international customers send us an order using our order form shown below. Faxing the order is recommended for forms have credit card information for security reasons. If you provide a DHL, or Fed-Ex shippers account number, we can ship credit card orders right away. For Paypal orders we will send you a PayPal invoice through PayPal. Otherwise, we'll email you with the total shipping charges for your approval before proceeding. After your approval, credit card orders will ship within one day. PayPal customers will receive a PayPal invoice, and we will again ship within one day once the PayPal invoice is paid. We only use Fed-Ex services for international orders that are charged to our account and added to the invoice total. You can print out our order form and fax your order to: (425) 460-1011. Please fax orders to: (425) 460-1011.